The Boogie Woogie Foundation is a non-profit organization established to foster research and to increase the general public knowledge of the preponderance of evidence indicating an East Texas origin for Boogie Woogie. The Boogie Woogie foundation was also established to raise consciousness with regard to the many ways that Boogie Woogie has evolved and continues to influence the world after its creation. For example, early Boogie Woogie recordings are the unequivocal first recorded examples of what was later called "Rock and Roll." Consequently, Boogie Woogie has been rightfully called the "Father of Rock and Roll." Indeed, the influence of Boogie Woogie on Rock-and-Roll and popular music worldwide is greater than that of Blues in general. Put another way, Boogie Woogie can be regarded as the kind of Blues that has had the most influence on popular music throughout the world. Although profound in their own right, the slower, less-upbeat styles of Blues have not had this magnitude of influence. Moreover, the continuing influence of Boogie Woogie on popular music in general is undeniable. Boogie Woogie continues to be performed as a form of jazz, and has influenced classical composers throughout the world, including Conlon Nancarrow (United States), Nikolai Kapustin (Russia), and Louis Andriessen (The Netherlands). In a powerfully-worded testament of the demonstrated capacity and potential of Boogie Woogie to influence classical composers, Gyorgy Ligeti wrote the following on June 28, 1980: "If J. S. Bach had grown up with blues, boogie-woogie, and Latin-American music instead of the protestant choral, he would have composed like Nancarrow, i.e. Nancarrow is the synthesis of American tradition, polyphony of Bach and elegance of Stravinsky, but even much more: he is the best composer of the second half of this century." Boogie Woogie has also influenced cultures throughout the world in ways that are not directly related to musical expression. For example, the visual art of Piet Mondrian was profoundly influenced by the sound and other qualities of Boogie Woogie music. Mondrian stated, "True Boogie Woogie I conceive as homogenous in intention with mine in painting." Moreover, Boogie Woogie has had a substantial influence on the languages of various cultures, as exemplified by widespread use of "Boogie" and "Boogie Woogie" as marketing terms for various products and in contexts that frequently do not denote music, and which bear little relationship to the earliest meanings of the terms "Boogie" or "Boogie Woogie." Despite numerous examples that could be cited, the breadth and depth of Boogie Woogie's influence over space and time is generally not well known. By failing to recognize the extent of the influence of Boogie Woogie and by not giving credit to those who created Boogie Woogie, false historical accounts have been promoted (often unknowingly) that dishonor those African Americans who created Boogie Woogie in dangerous environments that literally put their lives at risk. For example, the Rock and Roll Hall of Fame's persistence in promoting the false claim of Jimmy Yancey as "the progenitor of Boogie-Woogie piano" disrespects the very people that the Rock and Roll Hall of Fame purports to honor. On page 183 of the classic 1939 book, Jazzmen, William Russell concluded his chapter on Boogie Woogie with the following statement: "Although the Boogie Woogie was originally dance music, it transcends any secondary function as mere accompaniment to words or movement and today has come to be recognized in its own right." The Boogie Woogie Foundation continues Russell's tradition of capitalizing "Boogie Woogie," and like Pine Top Smith (except when quoting another source), spelling "Boogie Woogie" without a hyphen. At 2 pm on Sunday, September 2, 2018, in Marshall, Texas, a formal dedication ceremony was held for a historical marker that has been placed by the Texas State Historical Commission. 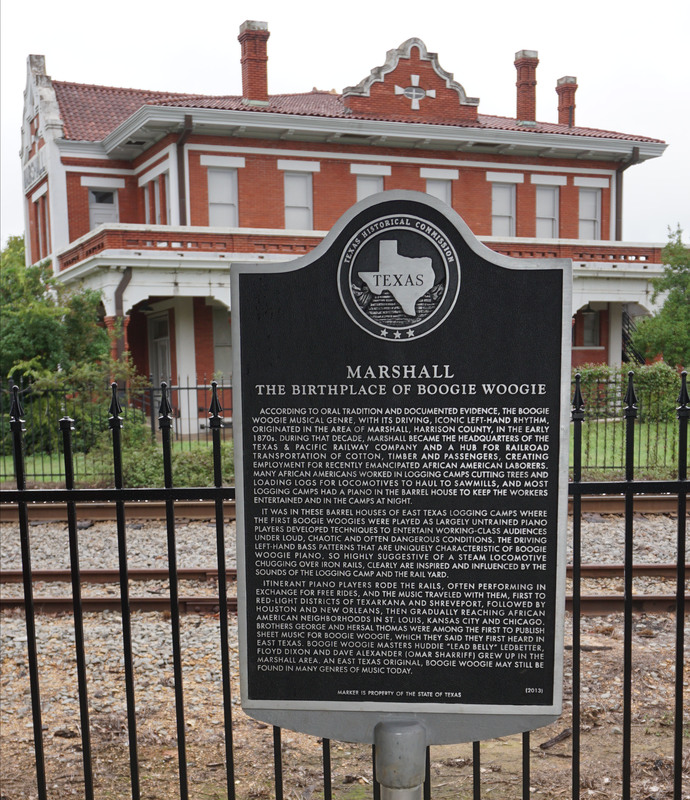 The marker celebrates Marshall, Texas as The Birthplace of Boogie Woogie. The Texas Historical Commission cast the historical marker as a result of the historical research of John Teninison, who was the first to conclude that the Marshall, Texas area was the Birthplace of Boogie Woogie. The marker has been placed near the historic Texas & Pacific Depot. Of all buildings that currently exist, the Texas & Pacific Depot in Marshall is the most symbolic to the earliest Boogie Woogie performances, as the depot lies at the geographical center of gravity from which Boogie Woogie spread along the Texas & Pacific tracks running North, East, and West from where the depot is located. The marker dedication ceremony took place at 2 pm at the northeast corner of the Ginocchio Hotel. The dedication ceremony for the historical marker was free and open to the public. During the ceremony, both John Tennison and marshall resident, Jack Canson spoke. 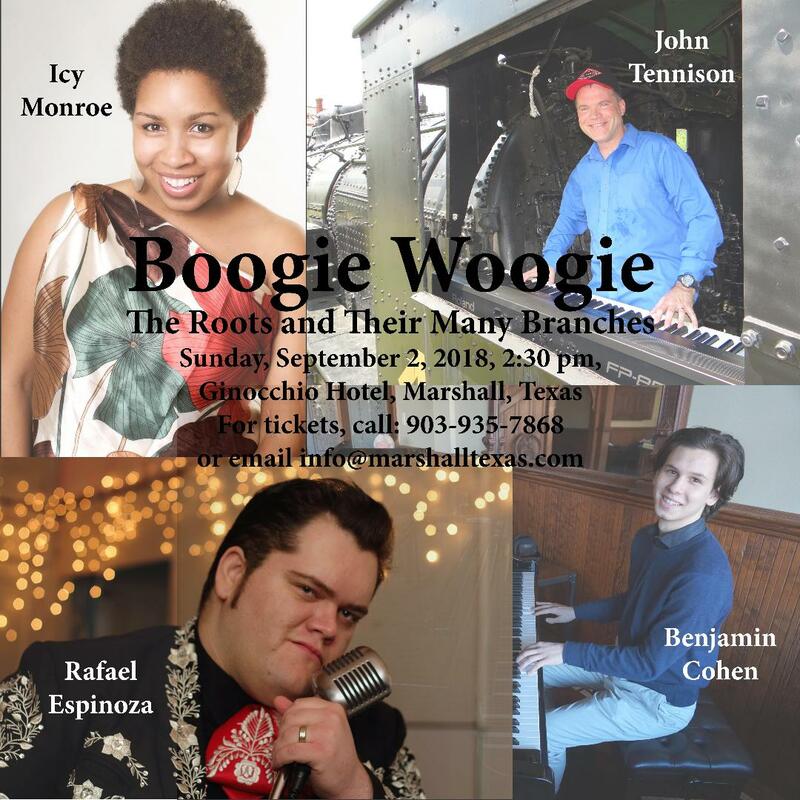 After the ceremony, John Tennison was joined by Icy Monroe, Rafael Espinoza, and Benjamin Cohen to present a concert and educational program titled: "Boogie Woogie: The Roots and Their Many Branches." The musical program took place inside the Ginocchio Hotel and explored the vast influence Boogie Woogie has had on diverse genres of music. As of August 27, 2018, tickets to the musical program had sold out. However, the PA system that was used for the concert and education program was loud enough that even those standing outside the hotel by the side walk were able to hear the content of the musical program. 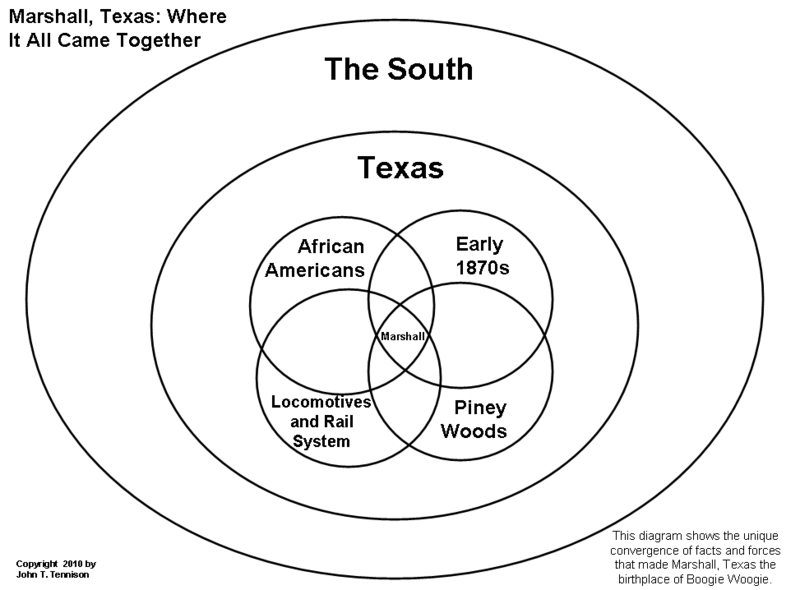 “The main areas where it first appeared were in Texas in the Piney Woods region where there were many lumber camps. And they used to have a barrelhouse there for entertaining their work force. Now, to this barrelhouse came itinerant pianists, particularly at weekends when they were relaxing – lots of drink, lots of dancing, lots of whoring going on, and I have heard that often people were killed, so there were pretty exciting times down there. It eventually moved into Chicago, St. Louis, and other urban areas because of the mass migration of African families, because of the poorer situation in the South, and the pianists went with them." Boogie Woogie was among the many genres of music discussed. The Regional Music Heritage Center presented the "Nancarrow Homecoming" concert. 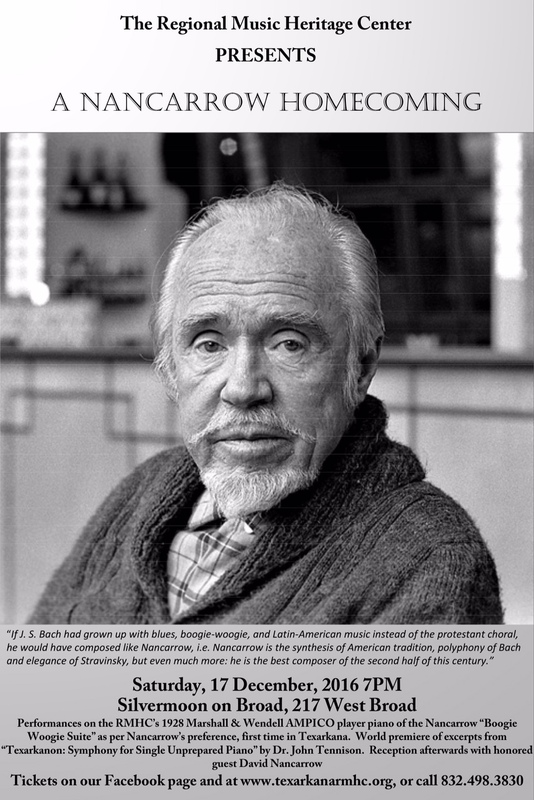 This milestone concert marked the first public live performance of Conlon Nancarrow's Boogie Woogie Suite in his home town of Texarkana. The concert was performed on Saturday, December 17, 2016 at 7:00 pm at the Silvermoon Theatre in Texarkana, Texas. Marshall, Texas, Birthplace of Boogie Woogie -- This website has historical information, videos, photographs, and information on upcoming Boogie Woogie events in Marshall, Texas. "Marshall, Texas: The Birthplace of Boogie Woogie" Facebook Page -- This Facebook page also has historical information, videos, photographs, and information on upcoming Boogie Woogie events in Marshall, Texas. On Sunday, October 11, 2015, Ezra Charles and Jakob Helpinstill performed a concert in Marshall, Texas which combined performance with narrative on the history of Boogie Woogie. Ezra Charles: "Marshall is the 'ground zero' of boogie woogie, because it contained all of the elements at the time to bring it to life." 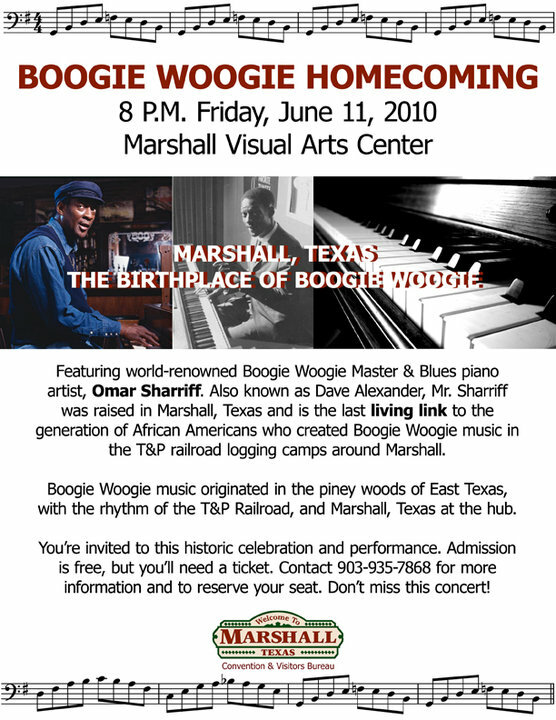 The First Boogie Woogie Heritage Fest was held in Marshall, Texas on April 12 & 13, 2013. The May/June 2011 issue of "The Medallion," the magazine of the Texas Historical Commission, featured Marshall, Texas on its cover. This issue of "The Medallion" has a beautiful photo of the Harrison County Courthouse on its cover, which states: "Marshall's Mystique: Railroad, African American Legacies Shape Northeast Texas City's Heritage." The following two articles appeared in this issue of "The Medallion." Marshall, Texas, Birthplace of Boogie Woogie was featured on National Public Radio’s “All Things Considered” Monday, January 17, 2011. "Pianist Brings Boogie Home: Sharriff Returns to Help Marshall Stake Musical Claim" -- This is an article by Lee Hancock from the front page of the Dallas Morning News, Friday, June 18, 2010. 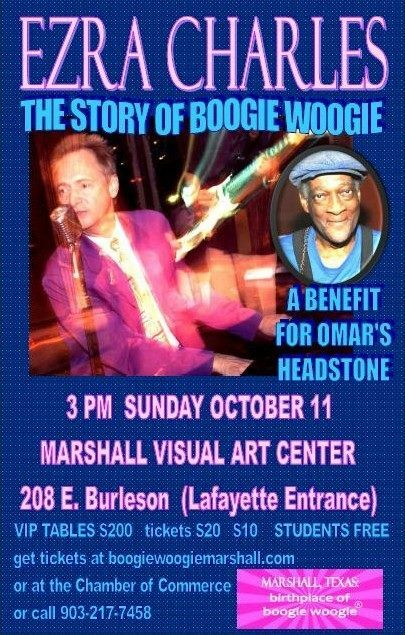 Poster from Omar Sharriff's Boogie Woogie Homecoming Concert on June 11, 2010 in Marshall, Texas -- Originally born “David Alexander Elam” on March 10, 1938, in Shreveport, Louisiana, Sharriff grew up in Marshall, Texas, where his father, Tom Elam (born 1893), was the first person that Sharriff ever heard play Boogie Woogie. 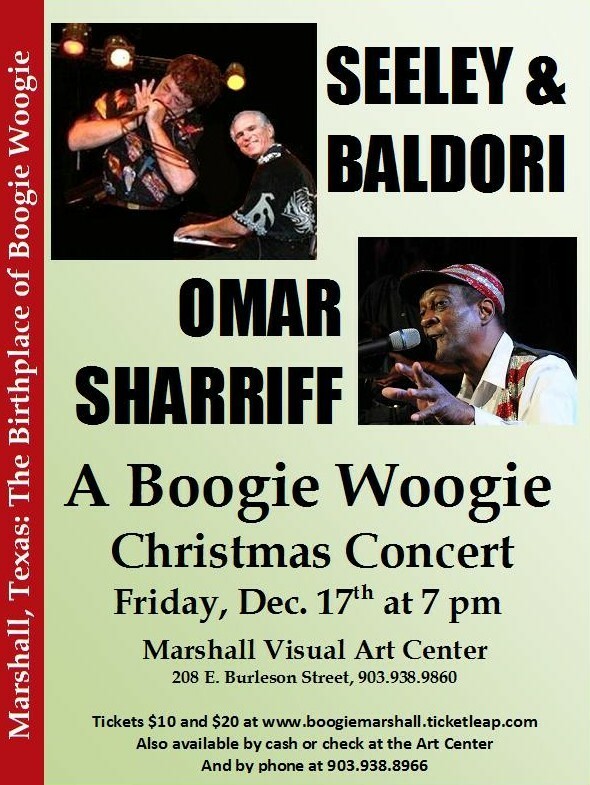 Sharriff's concert represented a historical turning point, namely that of formally recognizing and publicly supporting the continuing performance of Boogie Woogie in Marshall, Texas, the Birthplace of Boogie Woogie. "Birthplace of Boogie Woogie" Declaration -- This declaration was enacted unanimously by vote of the Marshall, Texas City Commission on May 13, 2010. Bob Seeley, Bob Baldori, and Omar Sharriff performed in Marshall, Texas, the Birthplace of Boogie Woogie, on Friday, December 17, 2010. 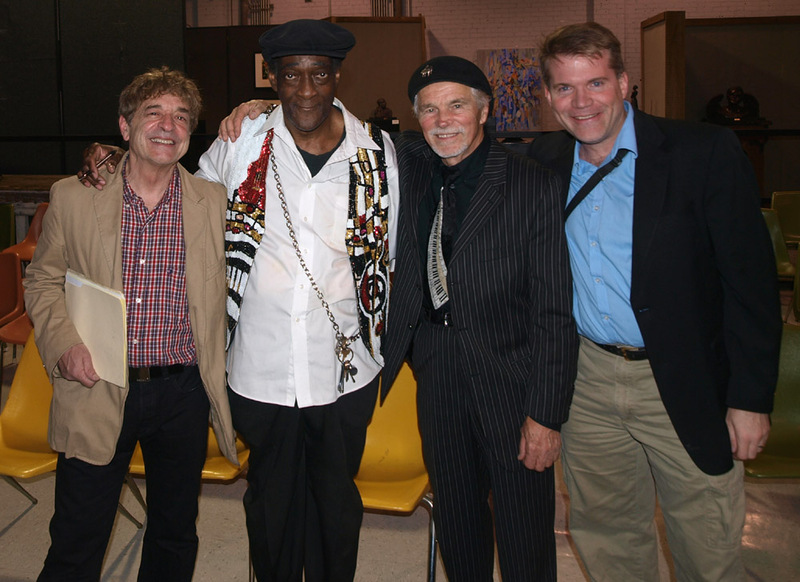 Pictured above from left to right are Bob Baldori, Omar Sharriff, Bob Seeley, and John Tennison after the concert in Marshall, Texas on December 17, 2010. In 2009 the American Music Research Foundation received the Gold Remi Award (pictured above) for its documentary titled, "International Boogie Woogie," based on footage from AMRF's 7th Annual Motor City Blues and Boogie Woogie Festival in Detroit, Michigan in 2005. At time of receiving the award above, AMRF Director John Penney commented, "It’s particularly appropriate that we received this award in Texas, the birthplace of Boogie Woogie." The “International Boogie Woogie” documentary contains solo and trio performances by four internationally acclaimed pianists at the 7th Annual Motor City Blues & Boogie Woogie Festival in 2005, including Switzerland’s Sylvan Zingg, France’s Philippe LeJeune, and Canadians Kenny “Blues Boss” Wayne and Michael Kaeshammer. Wayne emigrated from California to Vancourver, Canada, and Kaeshammer from Germany to Toronto, Canada. "Well David, it's really interesting to know that Boogie Woogie, which became such a craze all over the world, really got its start in the piney woods of East Texas. Having lived twenty years in Texas, I'm, you know, pretty proud of that." "And this song, 'The Fives,' was one of the ones that you couldn't be a Boogie Wooogie piano player if you didn't know "The Fives." It was pretty much understood that you had to know this song. All of these songs are based on the 12-bar Blues. And like the Blues, they're influenced very much by the sound of the train. So I think in all Boogie Woogie songs, you can hear the sound of the train." 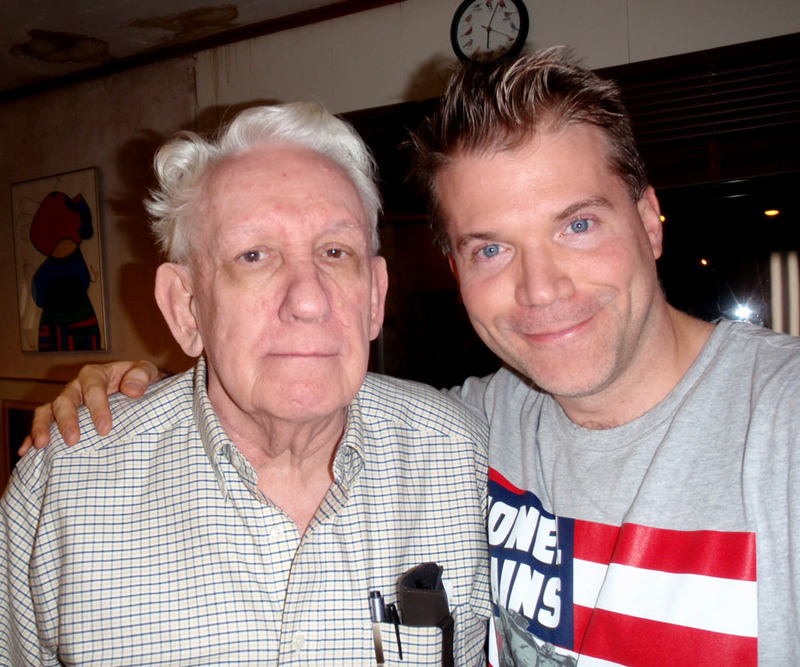 Pictured above are John Tennison and Axel Zwingenberger at Axel's Bosendorfer grand piano in Vienna, Austria, April, 2006. Zwingenberger is among the most prolific and influential of modern-day performers, composers, and scholars of Boogie Woogie. Consequently, Zwingenberger has inspired new generations of Boogie Woogie players all over the world, such as in Japan where Boogie Woogie pianist Keito Saito (born in 1978) specifically cites Axel Zwingenberger as an inspiration in the liner notes to Saito's 2008 album, Boogie Woogie Far East. 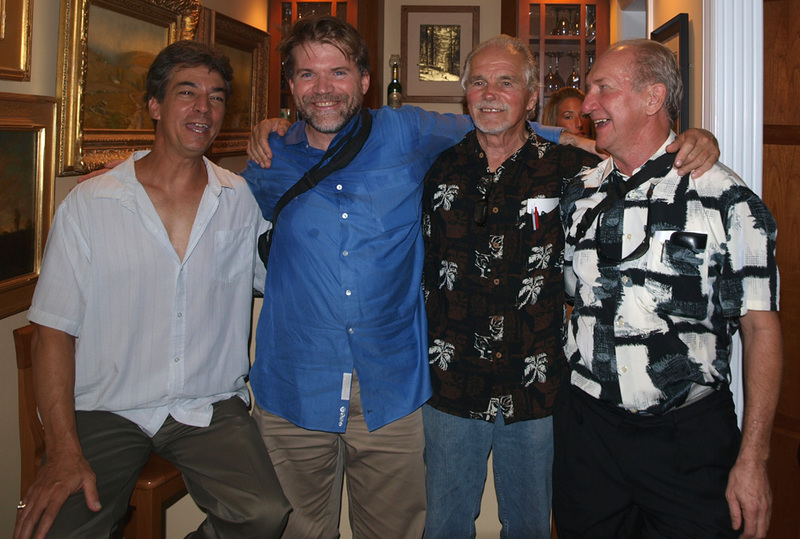 Pictured above from left to right are Rob Rio, John Tennison, Bob Seeley, and Rudy "Blue Shoes" Wyatt on August 6, 2010. In 2006, the BBC called the International Boogie Woogie Festival in Lugano, Switzerland "One of the most important piano events in the world." Pictured above are four performers from the 2006 International Boogie Woogie Festival in Lugano, Switzerland. From left to right are John Tennison (AKA Nonjohn), Papadon Washington, Silvan Zingg (festival organizer), and Chris Conz. A documentary showcasing the 2006 Boogie Woogie Festival was first broadcast by BBC World in its World Music Series: Destination Music on June 2, 2006. "I have read again your excellent study about boogie woogie: congratulations!" -- Jean-Paul Amouroux, February 13, 2012. "Some of the best information on Boogie Woogie and its origins can be found in a website established by John Tennison, also known as 'Nonjohn,' who is planning a book on the subject." -- Henry Wolff, Jr., Victoria Advocate, September 21, 2005. Click here to see full article. 1. Oral histories (including eyewitness accounts) given and transcribed after the fact of the events being studied -- Oral histories date the playing of Boogie Woogie at least as far back as the early 1870s in East Texas. 2. Written documentation dated at the time of events being studied -- An unequivocal, 12-bar Boogie Woogie bass line using a "Texas & Pacific" bass figure (AKA "The Cows") was published at least as early as 1915 in the sheet music of Artie Matthew's "Weary Blues (AKA "The Weary Blues"). 3. Photographs -- I do not know of any photographs that indicate a playing of Woogie Woogie prior to the dates in Item 1 and 2 above. Although a photo could document that a piano is being played, it would likely be difficult to know what style was being played from a single photograph. 4. Sheet Music and other written musical notation -- See Item 2 above. 5. Piano Rolls -- James P. Johnson's 1922 piano roll of "Joe Turner Blues" by W. C. Handy contains an explicit Boogie Woogie "shuffled chord" bass figure which Handy had not written into his "Joe Turner Blues." 6. Audio Recordings -- The earliest audio recording(s) of which I know that contained unequivocal Boogie Woogie bass figures are the two takes of "Weary Blues" by Artie Matthews, as performed by the "Louisiana Five" for the Emerson label in December of 1919 in New York City. 7. Film and Video -- I do not know of any film or video that pre-dates Items 1 and 2 above. John Tennison's Nonjohn Website -- contains information about Tennison's Boogie Woogie album, "Both Hands Like the Devil"
I want to thank people and organizations for having shared their knowledge of Boogie Woogie and history, and for having made suggestions that have helped me improve my ever-evolving Boogie Woogie database. Thanks to: Lee Ree Sullivan, Wilbur Smith, Artis Brewster, Jerry Atkins, George Gamble, Nancy Wyatt, Mack McCormick, Omar Sharriff (AKA Dave Alexander), Jack Canson, Nancy Canson, Jean-Paul Amouroux, Axel Zwingenberger, Silvan Zingg, Ezra Charles, Jim Cullum, Paul Oliver, Don Watson, Mike Meddings, Deirdre O'Connell, John Davis, Ron Harwood, Ryan Hertz, Bob Seeley, Bob Baldori, Robert Pinsker, Andrew Barrett, Richard A. Olliver, Morgan Wright, Krystyna Parafinczuk, Bob Bowman, William T. Block, Jr., Andrea Iken Tennison, George Iken, Alfred Tennison, Jr., Nancy Tennison, Frank Himpsl, Mike Montgomery, Kevin Witt, Bernd Reufsteck, Burgin Mathews, Alan Balfour, Andrew Petrou, Stuart Gregory, Bernhard Behncke, and Document Records. I invite anyone interested in the history of Boogie Woogie to contact me at nonjohn@nonjohn.com if they have any information that will contribute to a more accurate Boogie Woogie database. Moreover, I want to give credit to anyone who makes such a contribution.